The apartment is located in the private sector of the sanatorium "Kvitka Polonyni" on the territory of the sanatorium "Kvitka Polonini". The apartment is located 10 meters from the main building of the sanatorium. Spacious apartment for 4 people, equipped with all necessary appliances and comfortable furniture. 24-hour hot and cold water supply, heated floor, modern independent heating. There is a kitchen for self cooking. In addition, guests are offered cultural and entertainment activities for all tastes: hiking in the mountains, horseback riding, fishing, discos, concerts, sporting events, ice rink, pool, billiards, Internet cafe, children's playground. Wi-Fi is also available. It is possible to order excursions to the cultural and historical places of Transcarpathia and many other interesting events. The nearest lift is 20 m.
Description of the room: Cozy apartment with a large double bed and a sofa bed. Children live free of charge without providing extra space. 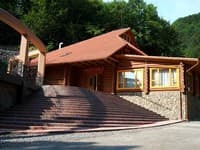 Sanatorium complex "Kvitka poloniny" is located in the Transcarpathian region, 5 km from the town of Svaliava, in the village of Solochin. A cozy corner is formed by the mountain ranges of the Carpathians and the valley of the Peny River. The apartment is located in the private sector of the sanatorium "Kvitka Polonyni" on the territory of the sanatorium "Kvitka Polonini". The apartments are located 10 meters from the main building of the sanatorium. In the complex treatment, three kinds of mineral waters are directly used from the springs: "Luzhanska-4", "Luzhanska-7", "Polyana Kvasova". In the health resort a wide range of indications for treatment: from gastroenterological to kidney and urinary system diseases, diabetes mellitus, metabolic disorders, musculoskeletal system, concomitant diseases of joints, peripheral nervous system, cardiovascular system, etc.